100 calories. Good source of 7 essential nutrients from plant sources. Good source of dietary fiber. Certified gluten-free. 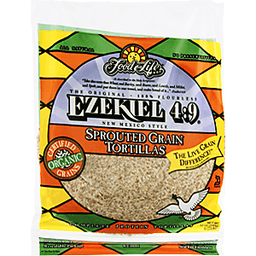 Made with sprouted ancient whole grains & superseeds. No added sugar. Non GMO Project verified. nongmoproject.org. Vegan. Trans fat free. 3 g good source of fiber. Salba chia. Certified seed. 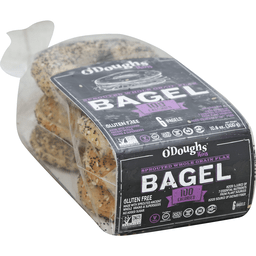 O'Doughs bakes gluten-free products that don't taste gluten-free! We're committed to using the highest quality ingredients to provide a taste difference you'll notice. We'd love to hear what you think. Phone: 416-342-5700. Fax: 416-636-9985. 1-855-O-Doughs (636-8447). www.odoughs.com. Declarations: no added sugar; made with sprouted ancient whole grains & superseeds; vegan; good source of dietary fiber. 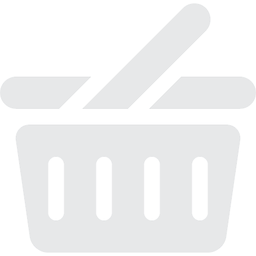 Follow us & post recipe ideas on Facebook; Twitter; Pinterest. Product of Canada.